Kitsap Animal Rescue & Education (KARE) is proud to be partnering with Terry Ryan again, this year in a new format, for an amazing and extremely fun workshop (lodging and meals included*). The camp will be held at the Seabeck Conference Center. Space is limited, so REGISTER TODAY! *Lunch is included for all Workshop registrants. If choosing Workshop & Lodging package, all meals are provided from check-in to check-out! 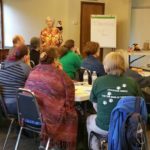 Beginning Chicken Camp – Shaping, Targeting & Discrimination (3 Days) SOLD OUT! We’ll practice mechanical skills with special attention to timing and eye-hand coordination. Lessons include observing and recording behavior, systematic desensitization, capturing a behavior, shaping a behavior and the use of targets. Students will work on a discrimination task. Effective coaching techniques to aid your training partner will be addressed. No experience required. 21 CEU credits are available. Tuition: (Includes snacks, lunch, and any handouts; breakfast/dinner included for those staying at the conference center). Prices listed below are per person. A 50% deposit is required to reserve your spot. Concepts and skills learned in Beginning Camp will be reviewed and expanded upon. Students will train several behaviors and assemble them into a chain using a combination of targeting, obstacle and moving behaviors. In addition to our planned advanced curriculum, there will be time for you to express your own training creativity. Times will be allocated to independently work with your chicken. Guidance as to lesson planning, execution and problem solving your selected behaviors will be provided as requested. Guest researcher on animal cognition will catch us up on recent research. Prerequisite: Completion of Poultry in Motion or Beginner Chicken Camp. 21 CEU credits are available. Cancellation policy. Please read and ask any questions you may have prior to registering. We unfortunately cannot provide exceptions to this policy. Please email us to register for Chicken Camp. Space is limited, registration and minimum 50% deposit is required. If you are paying by credit card and have already completed your registration form, please email us for payment instructions. If you prefer to pay by check, please mail it to Kitsap Animal Rescue & Education or KARE at PO BOX 994, Silverdale, WA 98383. Your spot in the workshop is held with receipt of payment. Please read the cancellation policy stated above. This workshop is for humans only. For the comfort of the birds, no dogs can be permitted in the building during Chicken Camp. 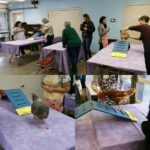 If you have not attended one of Terry Ryan’s Chicken Workshops before, a typical day at camp has students working in pairs, taking turns training their own chickens and coaching their partner. Activity times will vary by workshop, but typically start at 9 AM and end at 4 PM each day. Lunch is provided on site and includes non-meat selections. A ten-minute break will take place approximately every hour. Morning and afternoon snacks will be provided. Water, soft drinks, tea and coffee are available all day. Did you know that there is a lot that you can learn from a chicken? Training a chicken stretches your planning and mechanical training skills for any animal you work with. The average chicken is faster than the average dog, so it’s a great chance to improve your coordination and timing. Since chickens will freeze or fly away if they don’t like the way you are training them, you will know immediately if you are pushing your chicken too hard or too fast. Terry’s chicken camp will cover the learning concepts of shaping, behavior chaining and object discrimination. If you can train a chicken, you can train anything! Why should dog trainers train chickens? Trainers do not have bad (or good!) chicken training habits because they’ve never trained a chicken before, thus avoiding the baggage often taken to dog training workshops. Training a chicken is a stretch and a boost to your mechanical skills. The average chicken is faster than the average dog, giving you a chance to improve your coordination and timing. Chickens will freeze or fly away if they don’t like the way you are training them. Unlike dogs, you will know immediately if you are taking advantage of a chicken or pushing too hard, too fast. Chickens don’t give their trainers a second chances as often as our dogs do. You will not be showing your chickens at the next performance event, nor will you be taking them home, so there is no pressure on what will happen in the future. You probably do not have a library full of chicken training books and DVD’s to influence you, much less televisions shows on chicken training. 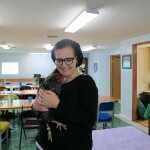 Instead, you can take advantage of this amazing opportunity to work with Legacy’s resident flock of chickens. Each student will have one or two chickens to handle and train using a clicker and food pellets. Students will work in pairs, taking turns training their own chickens and coaching their partner. terry has invited two special guests to chicken camp! Jade Fountain, BSc, KPA CTP, CPDT-KA, is an internationally trained professional animal trainer and behavioral consultant from Australia. She owns and operates Animal Behaviour Matters, with a passion for training with a purpose for companion animal behavior resolutions and conservation of endangered species and providing animal behavior education. Qualified as both a zookeeper and behavior consultant, she has worked with a range of species from marsupials, birds and big cats to dogs and elephants. In her career she has worked extensively with shelters animals, leading behavior and training teams, trained dogs and cats for film and TV, worked with training endangered species for ambassador roles, has been involved in training service dogs for assistance roles and most recently has been involved with training detection dogs for conservation. Jade has been working in conservation-based recovery programs at zoos and wildlife parks throughout Australia and overseas, including the Save the Tasmanian Devil Program, Zoos Victoria, ACT Parks and Wildlife, DeWildt Cheetah and Wildlife Centre and the Endangered Wildlife Trust in South Africa. 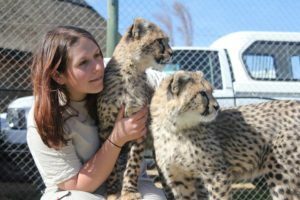 Her career highlights have been training cheetahs and dogs while living and researching in South Africa, involvement in wildlife anti-poaching projects, working with companion animal welfare, and with Tasmanian devils. Jade is completing a Masters in animal behavior and holds a degree in zoology and psychology. She spends her time between Australia, the USA and Africa, in learning, teaching and training across the applied behavior analysis, behavioral ecology and conservation biology fields. 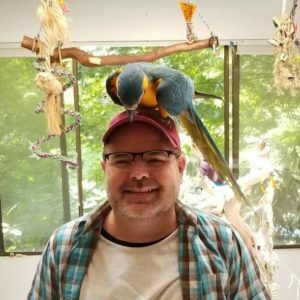 Dr. Eduardo J. Fernandez received his Ph.D. in Psychology (minors in Neuroscience and Animal Behavior) from Indiana University, where he worked with the Indianapolis and Cincinnati Zoo. He received his M.S. in Behavior Analysis from the University of North Texas, where he founded and was President of the Organization for Reinforcement Contingencies with Animals (ORCA). Most of his past and current work involves conducting research on the behavioral welfare of captive exotic animals found in zoos and aquariums. He has worked with close to 50 species of animals, with a focus on marine animals, carnivores, and primates. He is currently a Visiting Professor in the School of Behavior Analysis at Florida Institute of Technology. His past positions include an Affiliate Professorship in the Psychology Department at University of Washington (UW), Research Fellowship with Woodland Park Zoo, and National Science Foundation Postdoctoral Fellowship. While working with UW and Woodland Park Zoo, he started the Behavioral Enrichment Animal Research (BEAR) group, which conducted welfare research with the African and Asian elephants, hippos, Humboldt penguins, grizzly bears, sun bears, sloth bears, Sumatran tigers, jaguars, African wild dogs, meerkats, golden lion tamarins, and ostriches located at the zoo. Eduardo also continues to run the Animal Reinforcement Forum (ARF), which is dedicated to group discussions on animal training and behavior from a scientific perspective. Terry Ryan, CPDT-KA, KPA CTP Faculty, President, has been a dog training class instructor since 1968. 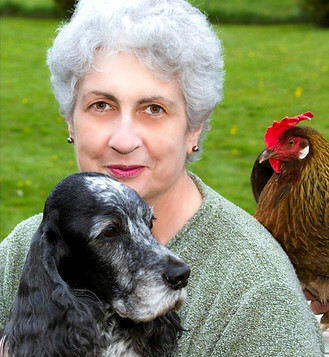 Through Legacy, Terry teaches pet dog classes, writes books, presents national and international seminars and workshops, hosts interns, and does consults. Visit Legacy Canine for details.